I’ve been involved in the cryptocurrency world since late 2015. I’d heard about Bitcoin much earlier, but was fully focused on my IT business and family at the time, with little room for anything else. By late 2015, I had sold my business, and was ready for a new challenge. Maybe that was a good thing, since Bitcoin had proceeded through the scary parts of the Hype cycle in the interim, and was now ready for the long and steady upslope. This was something I had missed out on before with other industries, unfortunately. As I was graduating high school in 1985 the PC industry was hitting its stride. Instead of participating, I went to the Naval Academy to learn electrical engineering. In the early 90’s, when the Internet was starting to grow, I was operating a 1960’s era nuclear power plant under the Pacific ocean. Major technology trends were passing me by. I could only continue reading my steady diet of hard science fiction books and dream. Finally, by 1994, my indenture to the Navy was repaid. I had traded a college degree, an advanced degree, and leadership experience as a US Navy submarine officer on a fast attack submarine with five years of my prime years. I was 26, newly married, and ready to enter the business world and make my mark. Of course, no one wanted an engineer with no engineering design experience. That sucked. I got a job in Hawaii selling industrial water treatment. A few years later moved to Denver to sell semiconductors, a technology which had its heyday in the 70’s. In the late 90’s I moved up the technology curve again when I went to work for Cisco system selling data networking. And in 2002 started my own IT business to sell a rapidly growing technology called Enterprise Voice over IP phone systems. Finally, I was at the cutting edge of technology! I was proud to work at Cisco. We were regularly bombarded with messaging about how we had the best sales team in the industry, our products were changing the world, and we should be proud of what we were doing. And I was proud! There was something that bothered me, though, and it was the way we went to market. See, I talked to customers about the great things Cisco products could do for them, but I never actually could see that my promises were fulfilled. That was up to the channel partner. The channel partner created the actual bill of materials and scope of work for the deployment. The channel partner accepted the purchase order, staged the material, did the upgrade, and engaged in a long term support contract with the customer. And, as I learned when I was assigned Wyoming for Cisco, made a lot of profits and had a lot of fun. My friend Win, from Casper, was selling Cisco IT products all over Wyoming. As a team, he and I started selling a lot of big Cisco upgrades in Wyoming. And after we sold the first few Cisco phone systems to customers, his business started to grow exponentially. He was having a great time, his customers loved him, and he was making so much money rumors were being spread in his hometown that he was a drug dealer! I was not having that much fun. I was making quota, making good money, but spent most of my time driving around and making promises I could not keep. It was time for a change. I saw how big the Cisco phone system opportunity was, so I decided to move to the southeast, and do the exact same thing Win was doing. I’m not going to tell that story, but in summary it worked, and we grew our business to over $50 million in sales before selling our company. Cisco VoIP new installations started to tail off in 2012, and that’s when I knew it was time to make a change again. I’d realized by then that I’m good at identifying technologies that were about to cross the chasm of acceptance, figure out how to make money with them, and ride them up the slope of enlightenment. By 2015 my partners and I had sold our company. I planned to stay long enough to make sure our 60 person team was taken care of, which turned out to be about 8 months. During this time I studied, learned, and planned. In 2015 there were many industries about to ramp. One of them was civilian use of unmanned aerial vehicles, or drones. There was Artificial Intelligence, machine learning, the transition to cloud computing and SaaS, and private spaceflight. The one that I kept getting drawn to was Bitcoin, and as I learned soon after, the entire crypto-currency ecosystem. I’ve always believe that the best way to get involved in a new industry is to just jump in wherever you can and get started. Within 2 years one can learn enough about it to be a relative expert, while building experience and contacts that can take you farther. I’ve also found that by the 6 year point I get bored and start looking around for something new to do, but if I can discipline myself to continue working it to the 10 year point that’s when the real profits are made. There are some technologies that truly change the world, and affect just about everyone in it. Some of them are such an ingrained part of our lives they are taken for granted, but at one time they didn’t exist. Plumbing, sewers, electricity, telephones, gasoline, radio, television, semiconductors, computers, commercial aviation, the Internet, mobile phones. As these technologies rolled through the world, fortunes were made by the pioneers that brought them to the people. The inventors of the technologies get the accolades, as do the businesses they built to carry them forward. General Electric, AT&T, IBM, Intel, Hewlett Packard, are all giants in industry. They deserve all the admiration they get. What is often overlooked, however, is the entire ecosystem of small businesses who take the technologies and help regular consumers use them. I found this our firsthand when I worked at Cisco. The lesson I learned was that when new technologies are being rolled out, when they are going from 20% penetration to 80% penetration of the available market, that’s when the technology enablers can profit, and have fun at the same time. It’s not necessary to be a wizard at the technology, all that’s required is to be able to understand what makes it work, figure out how to explain it to people, and help everyone who wants it to get it. Cisco would evangelize new technology to me the entire time I owned our Cisco channel partner company. They would come up with some new idea, ask us to invest time, money, and people in it to bring it to the Cisco customer base. Sometimes it worked well (Cisco phone systems), sometimes not so well (Cisco physical security, etc.). It was my job to work to figure out which of these new technologies had legs, and were going to run. The ones that did, we invested in. The others we quietly let go by the wayside. By the time we sold our business, we had been betting the fate of the company on these new technology adoptions on a regular basis. The best kept getting bigger, and the profits were getting smaller. It was time to move on. Bitcoin, now there’s a beauty of a technology! Building on the foundation of data networking, computers, mobile devices, and cryptography, it has the capability to change the entire world of finance. I think it will. So that’s where I am spending my time, money, effort, creativity, and hard work. I don’t talk about my ideas much with people. They think I’m crazy. It’s something I’ve had to deal with all my life. I read, a lot. I don’t watch TV or read newspapers or listen to anything other than music on the radio. Much of the time I listen to books while I drive. I have devoured 3-10 books per month my entire life, and I’ll be 50 this year. Is that 2000 books worth of information? Even if only 1000, that’s a lot of information to synthesize! There are many great science fiction writers who have poured their years of experience and ideas into predicting the future. I’ve been reading these books since I was 8 years old. Asimov, Heinlein, Poernelle, Niven, Gibson, and of course Neal Stephenson. If you want a crash course in what’s coming over the next 3 decades, read Stephenson’s Cryptonomicon, Snow Crash, and The Diamond Age. If you want some historical context, read the Baroque Cycle. I’ve read all his books, multiple times. The man is amazing, in his storytelling capability, his grasp of history and society, and his ability to see in the future. Why Bitcoin? It is the Cryptonomicon story, in real life. Real digital currency, that works. Part of the reason people thing I’m crazy to talk about it they don’t learn the history of money, debt, gold, silver, the successful and the unsuccessful, the real and the imaginary. Read Debt, the first 5000 years, to learn the myth of the barter economy, and how money was actually created and used. For an entertaining version of the history of money, read Stephenson’s Quicksilver and the follow-on books. The newest information about technologies today is found, not in books, but in different parts of the Internet. Youtube, Reddit, Steemit, Medium, Wikipedia, Github, topic specific forums, and personal blog postings are where people are building the new world. 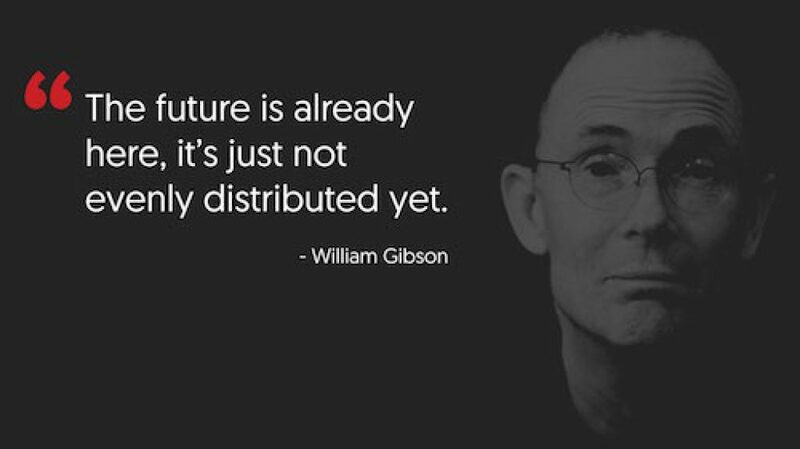 As William Gibson, the author who ushered readers into the cyberpunk genre, wrote, “The future is already here, it’s just not evenly distributed yet.” Just like people who don’t use social media don’t even know about the conversations happening all around them, people who don’t look for the new and world-changing know nothing about it. Other people hear about the technologies, but do nothing with the information. They get the sanitized version from Bloomberg, or some other publication. They hear about the people, the problems, the lurid, and the successes, after they happen. Most of the readers of the publications, if they care at all, are looking for an authority to tell them what to do, because they lack the ability to absorb, synthesize, sort, and make a choice about new technologies. They are afraid of making the wrong choice, so they wait until they have permission from their chosen authority. It’s pitiful, how often people put themselves into the power of others, and start working the agenda of these other people, instead of their own. So often, the authorities and thought leaders are wrong! It is a worthwhile exercise to read Taleb’s Incerto series of books. I am so looking forward to his new book, Skin in the Game, coming out soon. The experts are the people that are actually doing the work, in the industry, striving on a daily basis to make things better, make money, and succeed. The media analysts are not experts at all. For the Bitcoin industry, which is not even at 10% penetration, I chose to become involved so I could learn. I studied it for a while to figure out how I could learn and make money at the same time. It turns out the people in the Bitcoin industry who are making the most money are the ones that are literally creating the Bitcoin out of nothing, the Bitcoin miners. So that’s where I started. Now, a year later, I have learned a lot. I’m halfway through the 2 year period to where I have enough knowledge and experience in this industry to be dangerous. And fortunately I’ve been able to bring lessons and knowledge from the four other industries I’ve been involved in to accelerate the process. Why the long story? Why not just fling my opinions out there for everyone to enjoy? Because I want you, dear reader, to understand that what I tell you is not just from a flight of fancy, a regurgitation of someone else’s opinion, or a passionate pretension that will soon change. I’m not crazy. I’ve been working to figure out the future for four decades, have learned some of the lessons of history, and have actual technical experience in electrical, nuclear, and network engineering, with a smattering of software development and datacenter operations experience thrown in as well. Also, I built a successful business, grew it, and sold it, so have a good bit of business, leadership, sales, and negotiating experience as well. Bitcoin is the leader in the cryptocurrency space. It is the first, enjoys the benefit of the network effect, and has an ecosystem built through 8 years of its existence. People use Bitcoin as a store of value, as an investment, as a way to transfer value internationally, and as a currency. I do this, it’s not just something I’m telling you. Every month, I buy products from China in Bitcoin then sell them for dollars. It’s the way I get the money to pay the electric bill and rent for my Bitcoin mining business. I keep retained earnings in Bitcoin, and am happy to see it’s value go up. It’s much easier to send Bitcoin internationally than to do wire transfers, which I also do on a regular basis. Bitcoin will be around for a long time, because the system that it operates on is distributed worldwide. Bitcoin mining operations, Bitcoin nodes, and Bitcoin users are fully distributed, and can’t be stopped. If the Bitcoin protocol is changed too much and puts the system at risk, then node operators, mining pools, and miners will decide to continue to support version that maintains the value of the system. It can not be taken down by any government, or group of governments. It is a worldwide currency with a fixed and known quantity, under that control of no government, and open to all. Bitcoin spending keys can be carried in electronic devices, and even memorized, for crossing hostile borders or for use in countries with overzealous regulators. Bitcoin is even better than gold. Gold is physical, and can be taken. Gold can’t be used electronically. And the supply of gold could increase astronomically by asteroid mining. Bitcoin has none of those issues. Bitcoin is much better than the free-floating fiat currencies created by government debt. All government currencies go through a period of inflation, then get replaced. The only thing that changes is the amount of time this takes. Unfortunately, Bitcoin has problems. It is not the perfect digital money. The Bitcoin blockchain, its ledger of transactions, is open to analysis by all. Bitcoin activity can be correlated with other data to determine who is transacting with whom. It is also not scaling well, as transactions take too long and cost too much for it to be used as regular money. It’s complex to use, and there is no authority equivalent to commercial banks to prevent theft or keep people from making mistakes and losing their Bitcoin. Bitcoin’s problems will not cause its downfall, but they will prevent it from being used as digital money by regular people. Enter the Altcoins. These are the alternatives to Bitcoin. At last count, there are over 800 of them. Most of them are forks of the Bitcoin Github repo, with a few changes thrown in for variety. I’ll explain that a little more. You can run a Bitcoin node and be part of the system. It’s open to all. Go to Github and look up the Bitcoin project. It’s open source, with many contributors over the years. All the source code is there. You can download a copy, and run the programs. It’s not hard to do, I’ve done it myself. First you run the Bitcoin Daemon (bitcoind), which finds and communicates with other Bitcoin nodes across the Internet. A new bitcoind will download the entire history of transactions in the blockchain, about 60 Gigabytes of data in 2017, and relay any transactions it hears about to other Bitcoin nodes running bitcoind. There is a companion application which uses the bitcoind application, bitcoin-cli. This bitcoin-cli can have the bitcoind create a wallet, and use that wallet to publish a public address to which Bitcoin transactions can be directed. Bitcoin-cli can also be used to tell bitcoind to combine those transaction inputs into transaction outputs, in effect spending the Bitcoin it has control of. It gets a bit more complex than that, but that’s the gist of it. Altcoins are started by people by creating a copy of the Bitcoin Github repository, then making changes to it. That’s called a fork. The Bitcoin Github program continues on it’s way, and the fork of the repository creates a new coin. That’s how Litecoin, one of the first Bitcoin forks, was created. Litecoin is a little different than Bitcoin. It uses a different hashing algorithm. In Bitcoin, every 10 minutes or so, one of the nodes solves a difficult mathematical problem. The node that solves the problem sends the solution out to other nodes, who accept it. The math problem is to create a hash, one type of math function, of the previous solution, a list of transactions waiting to be confirmed, a Bitcoin creation function, and a number used once (a nonce). Whatever node solves the problem gets to keep the new Bitcoins and the transaction fees in the solution. Then the process starts over. The hash in Bitcoin is a SHA-256 computation. Every 20 days or so the difficulty target of the solution is adjusted by a node so the average solution time is 10 minutes or so. Some of the Bitcoin nodes are enhanced by thousands of special purpose SHA-256 computing machines owned by Bitcoin miners furiously working to find the solution to the math problem. These special Bitcoin nodes are called mining pools. The mining pool computer servers tell the miners that join their pool what number to use in the nonce for calculation, and what transactions to use. That way there’s no duplication of effort. If one of the miners in the mining pool finds the answer, it’s sent to the main pool node, and if accepted by the rest of the Bitcoin network the Bitcoin creation (known as the Coinbase) reward is distributed to the miners that are part of the pool, in proportion to the computing power contributed to the mining pool. Litecoin uses an algorithm called Scrypt. It was designed to use more memory than SHA-256, because SHA-256 computation engines are easy to build in ASIC’s, and memory is more expensive. When a new computation algorithm is created by an Altcoin like Litecoin, Ethereum, Dash, or Zcash, it is first designed to be computed by general purpose computer processors, like the one in your laptop. This type of processor is known as a CPU, a Central Processing Unit. Your laptop has a main processor made by AMD or Intel, a chipset, and memory. This makes for good general purpose computation. Soon after a new algorithm is created, software developers work as fast as they can to create software that can make use of graphics cards to solve the math problem. Graphics cards, also known as Graphics Processing Units, or GPU’s, have somewhere between 1000 to 5000 computing processors on them. These GPU processors are much less powerful than the CPU in your PC, but they have some memory to them, and can run quickly in parallel. Once these GPU’s are in the game, people stop mining with CPU’s, because it’s just not worth it. We saw this recently with Zcash. Zcash was first launched in October of 2016, using a new algorithm called Equihash. First only CPU’s could mine it, then a few different software developers wrote GPU mining programs that could use AMD and Nvidia GPU’s to solve the Equihash algorithm. Two developers are currently in the lead for miners who use AMD GPU’s on Windows and Linux PC’s, known as Optiminer and Claymore. These guys are making a lot of money, because they wrote their programs with a 2% fee in them. Equihash was created to specifically be memory-hard, or to require a lot of computer memory, to solve. This is in an attempt to prevent the next two stages of Altcoin mining computation, the path that SHA-256 (Bitcoin), Scrypt (Litecoin), and X11 (Dash), have already gone down. That path is CPU, then GPU, then FPGA. FPGA stands for Field Programmable Gate Array, a type of semiconductor which is semi-customizable. The leaders in this area are Altera and Xilinx. They are used for prototyping ASIC’s, or for creating low-volume purpose specific computation devices. For Bitcoin, there was a period where the state of the art Bitcoin miners were made out of FPGA’s. If there is enough volume, then a company will pay for the design, prototyping, and production of an ASIC. This stands for Application Specific Integrated Circuit, and is a highly optimized design of millions of transistors on one computer chip. It costs well over $10 million to get a state of the art ASIC to production. But if the demand is there, people will develop them. Right now there are at least 3 companies that have state of the art ASIC for doing the SHA-256 computation, and are putting these into production Bitcoin miners. Bitmain, Avalon, and Bitfury. Bitmain and Avalon sell theirs to the public in the form of Bitcoin mining servers, Bitfury does not. The whole Bitcoin and Altcoin mining process turns out to be a math problem involving money, not surprisingly. If you want to start mining for Bitcoin, you have to buy a Bitcoin mining computer, which costs about $1500, and run it. It uses about 1500 Watts of electricity. Running that Bitcoin mining computer for a month will earn you about $250 in Bitcoin. In one year, your revenue will be about $3000. From that revenue, you need to subtract your expenses. This includes building rent, Internet, payroll, taxes, electricity cost. For a nice round number, say that adds up to $100/month per miner if you run 200 of them. That’s $150 net per miner per month, or $1700 per year. Yes, there’s a lot of other things that can affect these calculations. But this is based on my experience, and has held true for 2016, anyway. It will change in 2017 and 2018. Bitcoin price, number of miners on the network, the halvening of the Coinbase reward coming in 2020, all will affect these numbers. Stay with me, here. In the first year, you pay off your miner. You need to save some of your Bitcoin, though, because 2-3 years after you buy your miner, you will need to go through a technology refresh and change it. This is because of the economics of semiconductors. Gordon Moore, co-founder of Intel, came up with an observation that the amount of computing power available on a semiconductor for a given price doubles about every 18 months. This has held true since the 1960’s. When you get that much doubling, the power of the exponential gets you some amazing creations. Read the book Bold, by Peter Diamandis and Steven Kotler for a fuller exposition of the power of the exponential. What’s important in this part of the explanation, is that the current semiconductor process technology is 14 nm. That’s what the latest generation GPU’s and ASIC’s are built on. The amount of electrical power used by the ASIC is approximately equal to the surface area of the ASIC. As an example, in 2015 the best Bitcoin miner available was the Antminer S7 from Bitmain. It used 28 nm ASIC’s, and one miner used 1500 watts and produces 5 TeraHash/second of SHA-256 computations. (kilo – 1000, mega – 1,000,000, giga – 1,000,000,000, tera – 1,000,000,000,000). In 2016 Bitmain release the Antminer S9, built on the 16 nm process, using 1500 watts and producing 12 TH/s of SHA-256 hash. It takes a lot of money to build a new semiconductor wafer fabrication facility. The fabs are usually built to handle a specific size semiconductor wafer, and to create ASIC at a specific process technology. Intel and Samsung currently have fabs producing ASIC’s at 14nm. I don’t know what the next semiconductor wafer technology will be, or when it will be available. I’m guessing it will be around 9 or 10 nm, and will be available in 2020. But I don’t really know. That’s why there is a window of a few years where there is a fairly predictable return on investment into ASIC and GPU mining. Of course, a different hashing algorithm is not reason enough for an Altcoin. For an Altcoin to be successful, it needs a reason to exist, and the ability to provide something that is currently lacking in the crypto-currency space. It needs a Vision, a Purpose, one that is big and unique and bold enough to draw a Community. Once this Community coalesces around the Altcoin, it takes action to realize the Vision, and draws in elements of an Ecosystem. For this discussion, the Community are the members and supporters of the Altcoin, whereas the Ecosystem is composed of groups that can profit from the Altcoin. Is Bitcoin destined to be the largest crypto-currency, forever? It might, because it was the first. But it also might not. An Altcoin might be able to rise up and overtake Bitcoin, if it was more useful, had a better community, and focused on user adoption better than Bitcoin and its Ecosystem does. That’s where things are today, where my knowledge takes me. One of the exciting things about the crypto-currency space is there that there is so much growth and opportunity! Especially with the overreach of the banks, countries, and traditional currencies, there is so much of a need for people to be able to conduct transactions with each other in a way that maintains value. Even though very little business is being conducted in Bitcoin now, and even through there is still a lot of growth and change the industry is going through, people are starting to realize that Bitcoin and the Altcoins are here to stay. This could be a time where the entrenched monetary interests, the banks and governments, start to feel threatened. Or perhaps banks and governments are looking for a transition to happen in the monetary system. Because, after all, money is not wealth. All the chasing of dollars and gold and silver and Bitcoin and Altcoins can sometimes obscure the fact that the mere possession of these tokens doesn’t necessarily put food on the table, or shelter overhead. Wealth is the ability to produce, to get things done. People with skills are a form of wealth. Productive land is wealth. A business with customers, employees, suppliers, and business relationships is a form of wealth. Currency is a universal token that lets people transact to get the assets they need. It is not wealth in and of itself. So the governments of the world might look at Bitcoin and say, “So What!” because they still have millions of people living in their country under their control. That’s why I think Bitcoin and the Bitcoin blockchain are just the start of something even more exciting. Just like in Neal Stephenson’s The Diamond Age, once the information systems become completely decentralized and encrypted, it’s entirely possible that governments will become restructured as well. Getting the Small and Midsize mines ready for springtime pollen	Can Dash Become More Valuable than Bitcoin? The Hardware part is easy… But Linux and Mining platforms will test my 70 year old brain. There were 2 misspelled words in your blog: I read slowly, and notice this sometime..
Error is in the second Paragraph after the Bullet list of altcoins that may do well. the other error , I did not write down.. In the first third of the Document, probably.